Mon Coeur is a stunning designer sofa available from La Cividana furniture. 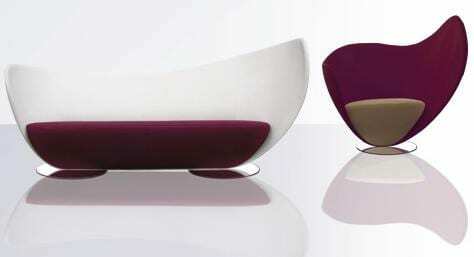 Mon Coeur features a minimalist approach towards cushions and upholstery as compared to the overall mass of the sofa. The picture highlights how small the cushion appears in contrast to the frame. The frame provides the most “wow” details. I like the way that it is shaped as a rounded shell and yet is higher on one side creating a visual focus on the non-conforming shape. Designed by Peter Harvey, Mon Coeur is made of a glass reinforced plastic frame with non-deformable polyurethane foam with polyester fiber. Measurements: 110 cm x 240 cm x 115 cm.